As a bit of a teaser for my upcoming Newfoundland trip I have created a photo album of my trip around the Avalon peninsula in 2007. This trip was undertaken after teaching Greenland-skills at the Kayak Newfoundland & Labrador (KNL) symposium. The trip served as a dry (wet?) run for Iceland, and to test and hone our gear choices. 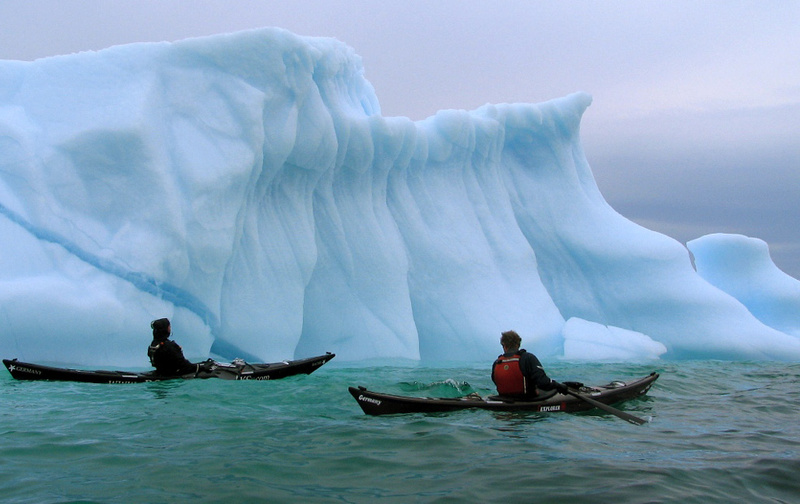 Icebergs are a common sight from the east coast of Labrador to Newfoundland’s southern shore — “Iceberg Alley”. These are bergs from Greenland that have been transported south via the Labrador current. 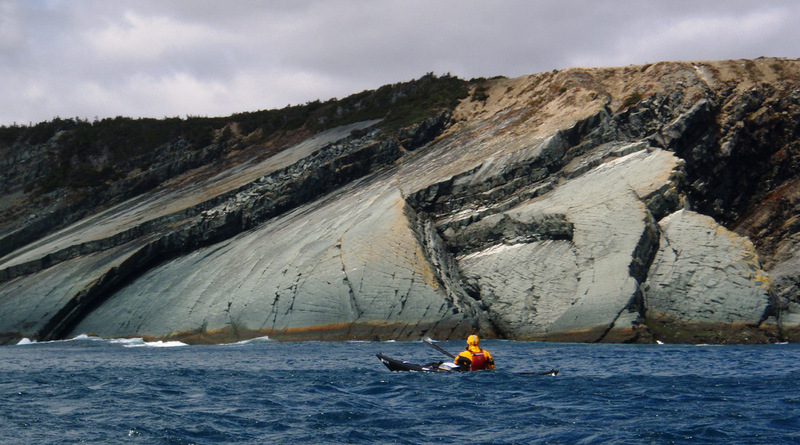 I should mention that paddling close to bergs, as in the image above is very risky business. Kayakers have died when the ice rolled suddenly, due to erosion of the immense ice mass underneath the surface. The ice is as beautiful as it is dangerous. 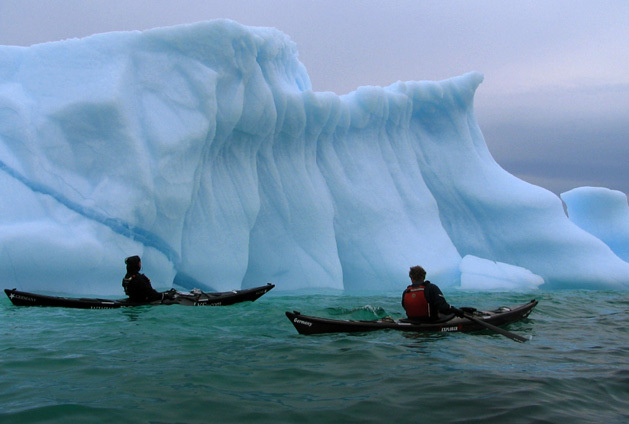 One local custom is to collect small “bergy bits” surrounding the iceberg and to cart it home via kayak. When added to scotch (or the drink of your choice) it fizzes loudly — literally a “Bergie Seltzer”. The effervescence comes from compressed air bubbles — Greenland air from centuries ago — trapped in the iceberg, that sizzle, fizzle and pop when thawed! “We shall not cease from exploration, and the end of all our exploring will be to arrive where we started and know the place for the first time”. — T.S. Eliot. I must admit that I generally don’t enjoy reading kayaking travelogues. You know, those blow-by-blow accounts where someone describes their trip — what they ate for breakfast, how many miles they paddled, what they ate for dinner, how they smelled on day fourteen, and so on. I have a hard time reading them. The reason being, for me, the trip is only the canvas on which a broader and more interesting story is told. For example, in the case of my Iceland circumnavigation with (ex) partner Freya Hoffmeister, I’m currently writing an article for Sea Kayaker Magazine. In it Iceland is just a fascinating backdrop to frame my struggle to create a new lifestyle for myself amid the pain of how the stresses of the trip accelerated the demise of the relationship that Freya and I shared. It’s a very difficult article to write well, and balance, but hopefully the result will be worth the effort — if I have the courage to be honest enough. 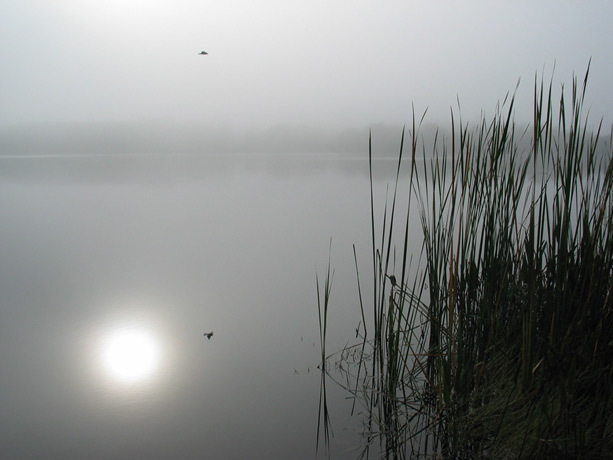 Hello and Welcome to my new blog and website! For a few weeks this site will be under heavy construction but please stop by and view the changes. In addition to sharing my thoughts on life and kayaking in this blog, this site will allow you to follow my progress on kayaking trips. I must admit that I’m not completely comfortable with the humility aspect of having a domain name in my own name, and having my face sprawled across a website. If you are put off by this, then I hope that you find the content to be down-to-earth and interesting. My next long adventure is a solo circumnavigation of Newfoundland, planned to start June 2008. I hope that you will follow me virtually around Newfoundland and freely share your comments. I will be using an NDK Greenlander Pro and Superior Kayaks carbon Greenland paddles. Many thanks to Sea Kayaking UK and also my friend Tom Bergh of Maine Island Kayak company for help with the logistics of obtaining a kayak for the trip. Please see my complete sponsor list for the people and companies that make my trips possible.